The Expos did a postcard set every year from 1981-90, maybe even further back from that (but no Wallach if they did), but up until now I've never had any of the Wallach's. 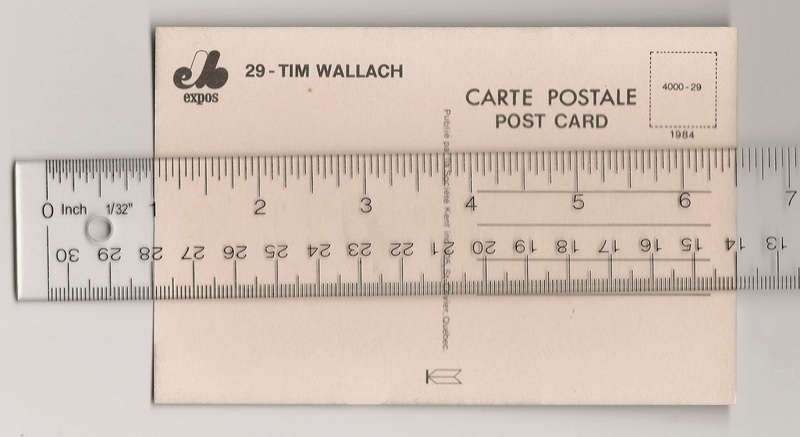 This is the first Expos Postcard of Wallach that I've picked up. They're not all that rare or uncommon, as I've seen them pop up regularly on ebay for years, I just never felt they were that high of a priority given all the other cards/items I was trying to budget. I see a lot of places that catalog these postcards as "baseball cards." I don't, and keep them on my non-card need list, rather than my card need list. So this, and any future ones I obtain aren't being added to the running card tally. Those catalogs in their infinite wisdom also show this as "card" #35. I don't see a #35 anywhere on the thing. 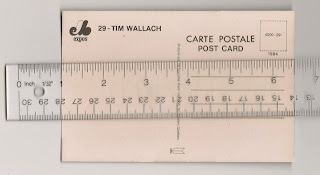 In fact, I see "29" twice, the second one, in the space for the stamp, really looks like a card number to me. To keep things simple, I'm just leaving the title numberless. I've always thought these were kind of dumb, but now that I have one in hand, I can begrudgingly admit it's sort of cool. My change of heart is due entirely to the back, which you'll have to take my word for, looks much better in person than in the scan. It just has a very authentic/vintage feel and look to it. I think it'd be kind of funny to send these post cards to the players that are on them. If I ever pick up a set, I may do just that. If you think it is cooler in hand than you thought it would be wait till you see how cool the 1972-83 Dimanche/Derniere Hore is in hand. 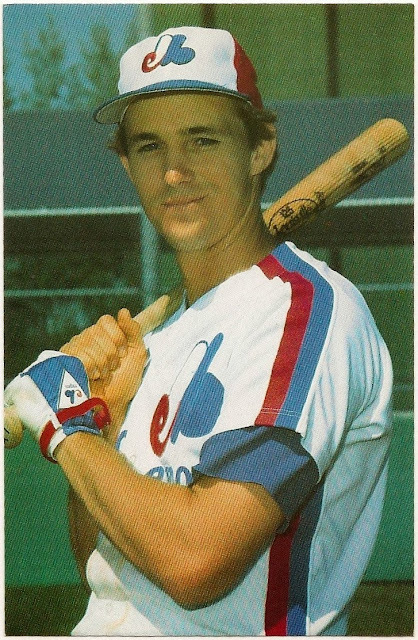 I picked up a 1983 Expos Spring Training Program the other day because it had a Virdon Postcard in it. 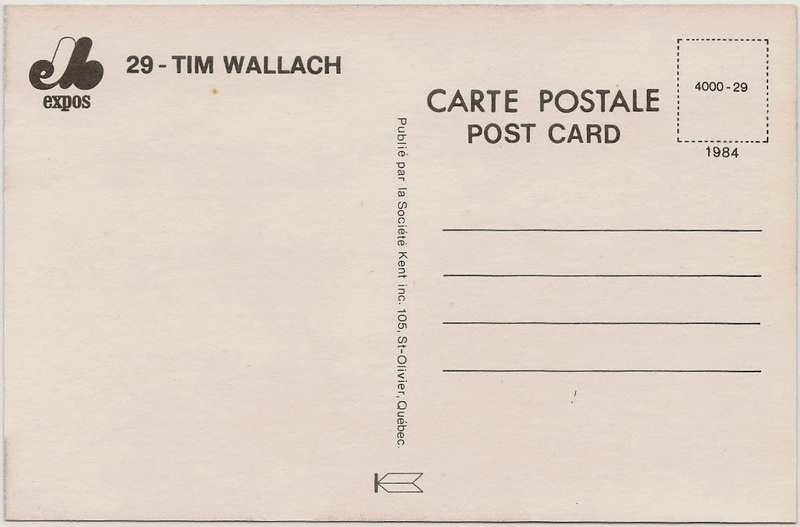 I'm planning to keep the postcard and get rid of the program, it has a few pictures of Wallach and shows him on the roster. (but not on the cover or any great big photos, only little ones) If you want it email me your address and I'll send it to you.